Please note: these plugins are no longer maintained. Plugin that allows setting status messages using dynamic variables. Requirements: Miranda IM v0.6 or newer and Variables plugin. You can find more info in the New Away System thread. 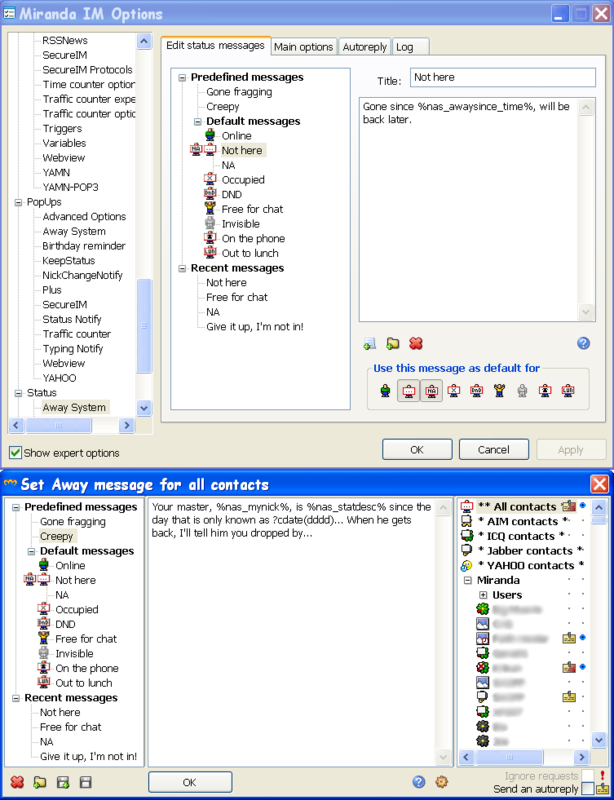 This plugin shows a notification when someone in your contact list changes his ICQ/Jabber custom status message. 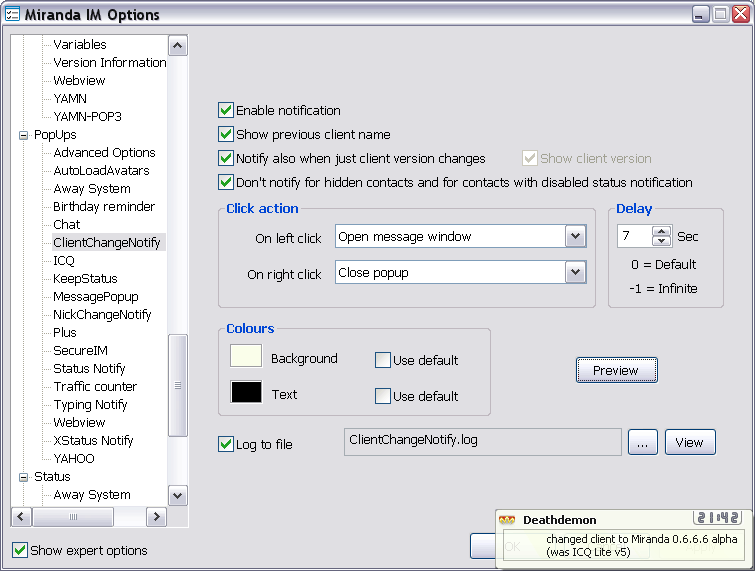 XStatusNotify requires Popup or YAPP plugin and Miranda IM v0.6.0.3 or newer. For more details, see XStatus Notify thread. Plugin that notifies when someone changes his/her IM client. Supports logging to a file using LogService plugin. Requires Popup or YAPP plugin and Fingerprint v0.0.0.18 or later to work correctly. ClientChangeNotify thread at the Miranda forums. 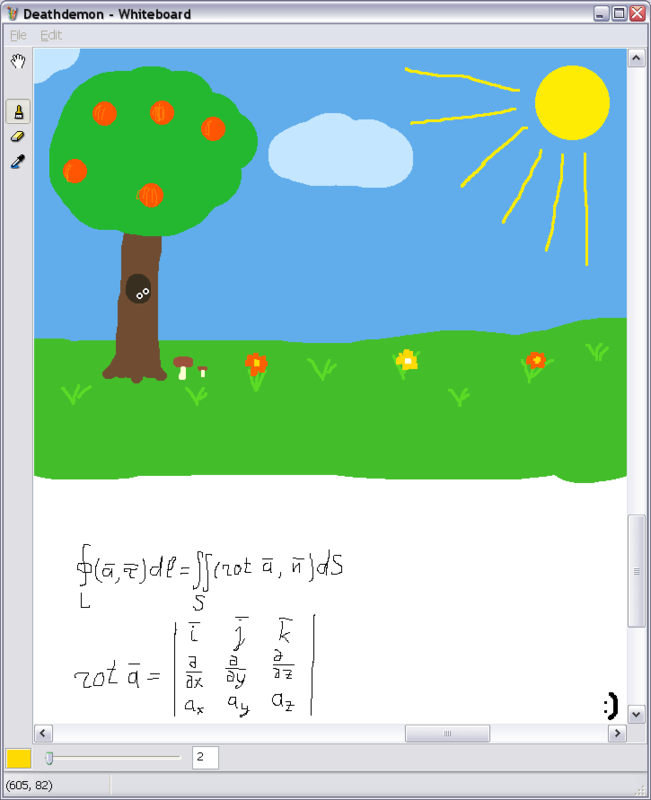 A collaborative real-time whiteboard for two users. Just select "Whiteboard" in a contact menu and start drawing, your friend will see it. Requirements: Whiteboard and DataAsMessage plugins must be installed on both sides. Whiteboard thread at the Miranda forums. Service plugin that provides an API for other plugins to transmit data to other contacts through usual messages. For more details, see DataAsMessage thread. This plugin provides logging service for other plugins. 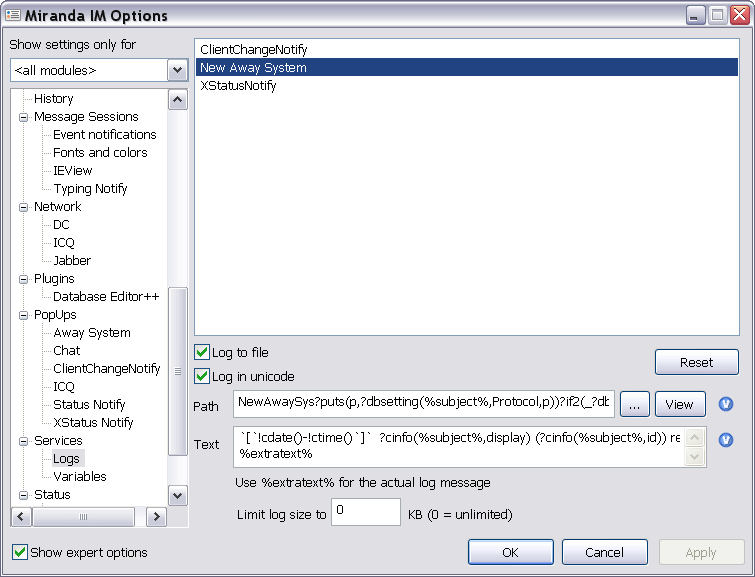 It takes care of ANSI/Unicode conversions, allows setting log size limit and changing log file name. Also it supports Folders and Variables plugins. With the help of Variables you can customize log format according to your preferences, or, for example, log to different files or folders depending on certain conditions. LogService thread at the Miranda forums. Program that can be used to increment build number in C/C++ projects automatically. A simple program for patching binary files. Allows replacing some specific sequence of bytes or replacing any sequence of bytes at a predefined offset. Uses simple scripts. A simple program that allows simulating keyboard input according to its command line parameters. Different input can be simulated depending on which window is currently in foreground. Run the program without parameters to see detailed usage instructions. These projects are licensed under the GNU GPL.